Amazon is blowing out the CaseCrown Leather iPad Case for just $1 plus $4.99 in shipping and handling. 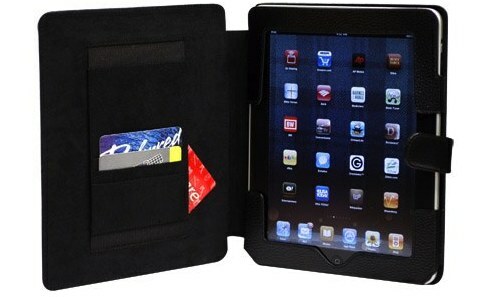 This is a 97% discount and by far the cheapest genuine leather case I’ve ever seen for an iPad. Why the huge discount? I have no idea, but grab it while you can. $1? How is this even possible? The iPad can fall out! It’s possible because of one thing – Slave labour. Enjoy. Read the reviews on Amazon before ordering… Multiple people claim that the iPad slips out because the cases is a bit loose and there’s nothing on the top to keep it from falling out. Sounds like some modification is necessary or your savings will shatter on the floor. I have one of these they are pretty nice but I wouldn’t go swinging it around and expecting the iPad to stay put, the iPad slides in which is secure enough but not so secure that you could hang onto it from the side and expect it to not move. Anyway these are so cheap because they won’t fit the upcoming iPad model, plus there’s no room for the camera in the back, thus you get good deals on cases for now. um, it says 17.21 … ? Steer clear. Look at where the case is in relation to the HOME button. It intrudes into the visible/touchable screen area all the way around making it nearly impossible to use the iPad. Really a crap design.